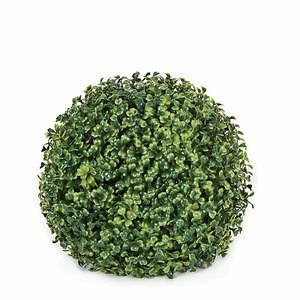 10 Inch Polyblend Plastic Boxwood Topiary Ball is an eye catcher grouped on your deck, around your garden or patio. For outdoor use. Topiary gardens lend fun and beauty to many settings. Whether you plan on installing one of these displays in a paved area, such as a patio or parking lot, or in a landscaped, park-like setting, well-maintained topiaries provides visual interest. Use them to express creativity in many locations! Today, owners of topiary plants frequently raise them indoors in containers. However, you can also create outstanding permanent or semi-permanent outdoor topiary displays by paying close attention to the climatic and temperature requirements of your collection. The first step in establishing an outdoor topiary necessarily involves designating a specific area in your garden for this activity. Traditionally, many topiary horticulturists worked with native outdoor topiary trees or vining plants to develop stunning visual images arrayed around metal frames. (1) However, today numerous outdoor topiary plants also grace paved locations. Container plants work especially well on covered surfaces, such as patios, steps or concrete expanses. (2) If you reside in an area where cold spells require periodic plants removal to a warmer greenhouse environment, makes sure you install only semi-permanent displays. Hen and Chicks, and more. Maintaining topiary plants involves rigorous attention to pruning and training branches to grow in preferred locations, such as along (or within) metal frameworks. Much as bonsai growers spend hours carefully working with young plants by cutting root systems to help maintain miniature displays of great beauty, topiary artists spend a lot of time caring forthe individual plants within their collections. (4) As the plants grow and develop over the course of different seasons, topiary gardeners closely monitor any changes in foliage size, shape and color. They must also consider watering and sunlight requirements when placing plants outdoors. In this respect, container plants provide an especially helpful resource for beginning topiary gardeners. (5) These smaller plants will usually transfer more easily into a greenhouse environment, if required. If an outdoor topiary plant growing in a container temporarily loses its shape, a gardener easily relocates it indoors to provide intensive cultivation assistance. This portability feature enables topiary growers to rotate plants in an outdoor seasonal topiary garden successfully!